The Second Vatican Council, in its Decree on Ecumenism No. 3, teaches us that, "...some and even very many of the significant elements and endowments which together go to build up and give life to the Church itself, can exist outside the visible boundaries of the Catholic Church: the written word of God; the life of grace; faith, hope and charity, with the other interior gifts of the Holy Spirit, and visible elements too. All of these, which come from Christ and lead back to Christ, belong by right to the one Church of Christ. It follows that the separated Churches and Communities as such, though we believe them to be deficient in some respects, have been by no means deprived of significance and importance in the mystery of salvation. For the Spirit of Christ has not refrained from using them as means of salvation which derive their efficacy from the very fullness of grace and truth entrusted to the Church. Nevertheless, our separated brethren, whether considered as individuals or as Communities and Churches, are not blessed with that unity which Jesus Christ wished to bestow on all those who through Him were born again into one body, and with Him quickened to newness of life-that unity which the Holy Scriptures and the ancient Tradition of the Church proclaim. For it is only through Christ's Catholic Church, which is "the all-embracing means of salvation," that they can benefit fully from the means of salvation. We believe that Our Lord entrusted all the blessings of the New Covenant to the apostolic college alone, of which Peter is the head, in order to establish the one Body of Christ on earth to which all should be fully incorporated who belong in any way to the people of God." (UR, No. 3). "I urge you, brothers and sisters, in the name of our Lord Jesus Christ, that all of you agree in what you say, and that there be no divisions among you, but that you be united in the same mind and in the same purpose. For it has been reported to me about you, my brothers and sisters,by Chloe’s people, that there are rivalries among you. I mean that each of you is saying, "I belong to Paul," or "I belong to Apollos," or "I belong to Cephas," or "I belong to Christ." Is Christ divided? Was Paul crucified for you? Or were you baptized in the name of Paul? For Christ did not send me to baptize but to preach the gospel, and not with the wisdom of human eloquence, so that the cross of Christ might not be emptied of its meaning," Rev. Dargis suggested that no one man or one church has all the answers and that we are no different from the people St. Paul was addressing at Corinth when we say, "I follow the Pope" while still others say, "I follow Martin Luther." What Fr. Dargis failed to mention in his homily is that St. Paul was addressing those who were creating divisions within the Church founded by Jesus Christ. He also failed to address the Magisterial teaching that, "Christ bestowed unity on his Church from the beginning. This unity, we believe, subsists in the Catholic Church as something she can never lose, and we hope that it will continue to increase until the end of time..." (Catechism of the Catholic Church, 820) and that, "...we must realize ‘that this holy objective - the reconciliation of all Christians in the unity of the one and only Church of Christ - transcends human powers and gifts.’" (Catechism of the Catholic Church, No. 822, citing UR, No. 24). Cardinal at pro-life Mass: Roe v. Wade "will not stand." "...by the authority which Christ conferred upon Peter and his Successors, in communion with the Bishops-who on various occasions have condemned abortion and who in the aforementioned consultation, albeit dispersed throughout the world, have shown unanimous agreement concerning this doctrine-I declare that direct abortion, that is, abortion willed as an end or as a means, always constitutes a grave moral disorder, since it is the deliberate killing of an innocent human being. This doctrine is based upon the natural law and upon the written Word of God, is transmitted by the Church's Tradition and taught by the ordinary and universal Magisterium. No circumstance, no purpose, no law whatsoever can ever make licit an act which is intrinsically illicit, since it is contrary to the Law of God which is written in every human heart, knowable by reason itself, and proclaimed by the Church." (Evangelium Vitae, No. 62). "Radical individualism is the only explanation for the Supreme Court's creation, out of thin air, of a general and undefined right of privacy. The Court used the invented right, allegedly to protect the sanctity of the marital bedroom, to strike down a dormant Connecticut statute prohibiting the use of contraceptives. But marital privacy was shortly transformed into individual autonomy when the Court invalidated a Massachusetts law restricting access to contraceptives by single persons. That in turn led to Roe v. Wade and the right to abortion. Whatever one's feelings about abortion, the decision has no constitutional reasoning. Roe is nothing more than the decision of a Court majority to enlist on one side of the culture war." - Robert H. Bork. And this is precisely why Roe will not stand. Roe is a judicial fabrication. The Court said that the "right to privacy," wherever it may be found in the Constitution (an admission that this "right" has no "constitutional reasoning" as Robert Bork put it), is nevertheless broad enough to encompass abortion. "What was the rationale the Church used for including the term "perfidious Jews" in the Good Friday Liturgy? My dictionary defines this term to be "of deliberate breach of faith or trust." "The word 'perfidious' in the old Good Friday liturgy referred to the rejection of God's Son the Messiah by the Jews who called for his crucifixion. He had given them proofs of who He was, but they closed their eyes and ears to them. Though it may be counter-productive to make this point in today's age, this willful blindness to the truth is spectacularly evidenced by the Sanhedrin when they received the report of Jesus' Resurrection from the Roman guards at His tomb. There were 16 guards on duty, only 600 yards from Pilate's government house and residence; they were certainly not all asleep, for sleeping on watch by a Roman soldier was punishable by death. If the Sanhedrin believed their report, they knew a miracle had happened. If they disbelieved it, why did they not denounce them to Pilate and have the apostles arrested for stealing Jesus' body, either with the complicity of the guards or because of their negligence? But the Sanhedrin did neither, instead bribing the guards to say that Jesus' disciples had stolen His body while they slept, and promising to protect them from Pilate. They must have known or at least guessed the truth, and yet refused to believe. In any case, the expression 'perfidious' cannot logically apply to Jews apart from the circumstances of the crucifixion..."
Therefore, it is ridiculous for some (like the anti-Catholic propagandists at the Cohen Center), to view or interpret this as an "anti-Semitic" liturgy. Talk about taking something out of context! Exactly John. Well said. But expect these confused souls to suggest otherwise. After all, they can't let the truth get in the way of their agenda. "The rector of Rome's Sapienza University announced that he will re-invite Benedict XVI to visit the institution.Renato Guarini affirmed this after the inauguration ceremony today that was supposed to have included a lecture given by the Pope. The Vatican announced Tuesday that the visit would be postponed, due to what the Pope's secretary of state called a lack of the "prerequisites for a dignified and tranquil welcome." A small protest that eventually reached the point of several students occupying the rector's offices motivated the Holy See to cancel the visit. The protestors called the Pope 'hostile' to science and took issue with a 1990 speech by then Cardinal Joseph Ratzinger on the Galileo case. The 1990 speech in its entirety showed the protestors to have taken Cardinal Ratzinger's words out of context." But the fact that the Holy Father is changing this prayer of the Latin Mass so as to make it less offensive to the Jewish People in no way constitutes an admission of anti-Semitism. Nor does it have anything to do with Church teaching. The intolerance of tolerance. Can't you just feel the love for "diversity"? Shame on this magazine for insisting that while homosexual persons should be respected and treated with compassion, homosexual acts are sinful. I mean, how dare they express their Catholic Faith in public. Who is Mr. Peter Majoy and what is his agenda? In an article which may be found here: www.keeneequinox.com/news/2007/12/06/News/Town-Residents.Express.Concern.About.Catholic.Group-3137245.shtml, and entitled "Town Residents express concern about Catholic group," we read that Peter Majoy is "a Buddhist and member of the Richmond Planning Board" who is "currently teaching a Holocaust course at Camp Takodah in Richmond, to improve the town's image with Tom White, educational outreach coordinator for the Cohen Center for Holocaust Studies at KSC." Now, we have seen how Mr. Tom White has attempted to defend the anti-Catholic remark made by Mr. Henry Knight [ the Director of the Cohen Center] at this Blog. We have also seen Mr. White suggest that, "..any interpretation of his Papacy [Pius XII's] are at best, ongoing, as the Vatican has only recently totally opened their archives on this subject." And we have exposed this assertion as a lie. Talk to Action is a platform for reporting on, learning about, and analyzing and discussing the religious right -- and what to do about it. There is an editorial framework for this site than that is different than you will find on other major blog sites, so please read this carefully: We are pro-religious equality and pro-separation of church and state. We are prochoice, and we support gay and lesbian civil rights -- including marriage equality. Therefore, debates about the validity of abortion and gay rights are off topic." Secularists considerably tone down their opposition to religion, however, when it comes to certain special cases. Many make something of an exception for Buddhism, which they regard as having considerable merit. But the Buddhism they have in mind isn't Buddhism as actually practiced by ordinary people in East Asia. Rather, they have in mind Buddhism as it originally came from the hands of Gautama himself, or more exactly what they have in mind is original Buddhism as represented by present-day Western proponents of Buddhism. And this kind of Buddhism is more a philosophy than a religion; indeed, it's a philosophy one of whose aims is to undermine popular religion. It's represented as a non-theistic or atheistic religion - just the kind of 'religion' that might prove popular with the kind of people who are on the lookout for 'spirituality' but don't like religion or belief in God." (Can a Catholic be a Democrat: How the party I loved became the enemy of my religion," Sophia Institute Press, pp. 152, 153). There is cause for real concern here. Although Mr. Majoy has denied that he's anti-Catholic at The Keene Sentinel Talkback thread entitled "Richmond: A Town Divided," he has attempted to defend anti-Catholic sentiments expressed at the SBC Watch Blog in the form of a quote attributed to Thomas Jefferson which was posted by another supporter of the Cohen Center. Additionally, Mr. Majoy [as noted above] left a comment at the Cohen Center's Blog which was obviously intended to undermine the credibility of The Catholic League. What is the real purpose of the Holocaust course being taught by Mr. Majoy? And why is it that Mr. Majoy has recommended a website which is secularist in nature and which portrays opposition to abortion and homosexuality in political terms: as the result of the "religious right"? I'll ask the question again: Is the Cohen Center for Holocaust Studies at Keene State College politicizing the Holocaust to promote a liberal, secularist agenda? And isn't it interesting that while a woman named Terri O'Rorke wrote me several emails a couple of months ago indicating that Mr. Majoy wanted me to speak at this "Holocaust course," the invitation was apparently withdrawn when I went on record as defending the Church and Pius XII? Dialogue? Invitation to discussion? Don't you believe it. * Note: At The Keene Sentinel Talkback, a Blog sponsored by that newspaper, Mr. Pete Majoy has asserted that he never rescinded his invitation for me to speak at his "Holocaust Course" which is held at Camp Takodah in Richmond. I have offered (to anyone who is interested - and this apparently does not include the purveyors of anti-Catholicism who frequent that Blog) a copy of an email which shows that I accepted Mr. Majoy's invitation and that I was looking forward to hearing from him. Some relevant reading: John 8. And especially verse 44. The Israeli consul, Pinchas E. Lapide, in his book, Three Popes and the Jews (New York: Hawthorn Books, Inc., 1967) critically examines Pope Pius XII. According to his research, the Catholic Church under Pius XII was instrumental in saving 860,000 Jews from Nazi death camps (p. 214). Could Pius have saved more lives by speaking out more forcefully? According to Lapide, the concentration camp prisoners did not want Pius to speak out openly (p. 247). As one jurist from the Nuremberg Trials said on WNBC in New York (Feb. 28, 1964), "Any words of Pius XII, directed against a madman like Hitler, would have brought on an even worse catastrophe... [and] accelerated the massacre of Jews and priests." (Ibid.) Yet Pius was not totally silent either. Lapide notes a book by the Jewish historian, Jenoe Levai, entitled, The Church Did Not Keep Silent (p. 256). He admits that everyone, including himself, could have done more. If we condemn Pius, then justice would demand condemning everyone else. He concludes by quoting from the Talmud that "whosoever preserves one life, it is accounted to him by Scripture as if he had preserved a whole world." With this he claims that Pius XII deserves a memorial forest of 860,000 trees in the Judean hills (pp. 268-9). It should be noted that six million Jews and three million Catholics were killed in the Holocaust. We must remember that the Holocaust was also anti-Christian. After Hitler revealed his true intentions, the Catholic Church opposed him. Even the famous Albert Einstein testified to that. According to the December 23, 1940 issue of Time magazine on page 38, Einstein said:Being a lover of freedom, when the revolution came in Germany, I looked to the universities to defend it, knowing that they had always boasted of their devotion to the cause of truth; but, no, the universities immediately were silenced. Then I looked to the great editors of the newspapers whose flaming editorials in days gone by had proclaimed their love of freedom; but they, like the universities, were silenced in a few short weeks...Only the Church stood squarely across the path of Hitler's campaign for suppressing truth. I never had any special interest in the Church before, but now I feel a great affection and admiration because the Church alone has had the courage and persistence to stand for intellectual truth and moral freedom. I am forced thus to confess that what I once despised I now praise unreservedly. Pope Pius XII was a diplomat and not a radical preacher. He knew that he first needed to preserve Vatican neutrality so that Vatican City could be a refuge for war victims. The International Red Cross also remained neutral. Secondly, he knew how powerless he was against Hitler. Mussolini could quickly shut off electrical power to Vatican Radio during his broadcast (Lapide, p. 256). Finally the Nazis did not tolerate any protest and responded severely. As an example, the Catholic Archbishop of Utrecht in July 1942 protested in a pastoral letter against the Jewish persecutions in Holland. Immediately the Nazis rounded up as many Jews and Catholic non-Aryans as possible and deported them to death camps, including Blessed Edith Stein (Lapide, p. 246). Pius knew that every time he spoke out against Hitler, the Nazis could retaliate against the prisoners. His best attack against the Nazis was quiet diplomacy and behind-the-scenes action. 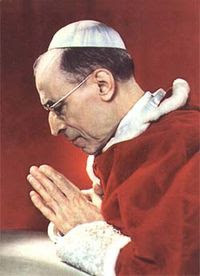 According to The 1996 Grolier Multimedia Encyclopedia (V8.01) under Pius XII, "Wishing to preserve Vatican neutrality, fearing reprisals, and realizing his impotence to stop the Holocaust, Pius nonetheless acted on an individual basis to save many Jews and others with church ransoms, documents, and asylum." But Pope Pius XII was not completely silent either, especially in his Christmas messages. His 1941 and 1942 Christmas messages were both translated and published in The New York Times (Dec. 25, 1941, p. 20 & Dec. 25, 1942, p. 10). To prevent retaliation, he did not refer to Nazism by name, but people of that era still understood him, including the Nazis. According to The New York Times editorial on December 25, 1941 (Late Day edition, p. 24): The voice of Pius XII is a lonely voice in the silence and darkness enveloping Europe this Christmas... he is about the only ruler left on the Continent of Europe who dares to raise his voice at all... the Pope put himself squarely against Hitlerism... he left no doubt that the Nazi aims are also irreconcilable with his own conception of a Christian peace. Also The New York Times editorial on December 25, 1942 (Late Day edition, p. 16) states: This Christmas more than ever he is a lonely voice crying out of the silence of a continent... Pope Pius expresses as passionately as any leader on our side the war aims of the struggle for freedom when he says that those who aim at building a new world must fight for free choice of government and religious order. They must refuse that the state should make of individuals a herd of whom the state disposes as if they were lifeless things. Both editorials recognize and highly praise Pius' words against Hitler and totalitarianism. Albert Einstein, an agnostic, spoke clearly: "The Church alone has had the courage." And: "Only the Church stood squarely across the path of Hitler's campaign for suppressing truth." The New York Times spoke clearly: "The voice of Pius XII is a lonely voice in the silence and darkness enveloping Europe." Those who have slandered Christ's Church and Christ's Vicar will one day be required by the Lord Jesus to account for their actions. Let's pray for them. "Whoever exalts race, or the people, or the State, or a particular form of State, or the depositories of power, or any other fundamental value of the worldly community...whoever raises these notions above their standard value and divinizes them to an idolatrous level, distorts and perverts an order of the world planned and created by God." "None but superficial minds could stumble into concepts of a national God, of a national religion; or attempt to lock within the frontiers of a single people, within the narrow limits of a single race, God, the Creator of the universe, King and Legislator of all nations, before whose immensity they are 'as a drop in a bucket' (Isaiah 11:15)." "The fool who has said in his heart, 'There is no God' (Psalm 13:1), goes straight to moral corruption, and the number of these fools who today are out to sever morality from religion is legion." "The human race, the entire human race, is but a single and universal race of men. There is no room for special races. We may therefore ask ourselves why Italy should have felt a disgraceful need to imitate Germany." "It is not correct to suppose that deported Jews are sent for labor service; the truth is that they are being annihilated." - Pope Pius XII, Second protest to the Slovak government upon learning that 52,000 Slovak Jews were marked for deportation to "labor camps" in Poland, March 14, 1942. "Tell your bosses, the Pope is not afraid of concentration camps." - Pope Pius XII, to a deputy of S.S. Lieutenant Colonel Herbert Kappler, chief of Gestapo forces in Nazi-occupied Rome, 1943. "I completely understand your point (and agree with it) that this [the Holocaust] wasn't the Church at all, but was demented individuals, who may have had a background in Catholicism... it is unfair to blame the Catholic Church for members who go astray.."
And while Mr. Tom White (a staff member of the Center) has argued that, "any interpretation of his Papacy [Pius XII's] are at best, ongoing, as the Vatican has only recently totally opened their archives on this subject," (a lie which has been refuted at this Blog), the Reich Central Security Office had no doubts about this great Pontiff. They considered him "the mouthpiece of the Jewish war criminals." It's not the record of Pope Pius XII which is in question. It's the credibility of the Cohen Center which is in question. "..any interpretation of his Papacy [Pius XII's] are at best, ongoing, as the Vatican has only recently totally opened their archives on this subject." - Mr. Tom White of the Cohen Center for Holocaust Studies at Keene State College.